It’s been more than a year since Penn State found itself facing a crisis of historic proportions. We watched for a week as the university’s leaders failed us over and over again. Many expected that the Board of Trustees would quickly change its practices to end the culture of secrecy and cronyism that has prevailed for so many years. Sadly, after 14 months, virtually nothing has been done to ensure Penn State won’t find itself facing a similar crisis again. That’s why I’ve decided for the second time to run for the Board of Trustees, which will accept candidate nominations starting tomorrow. We need new leaders with fresh ideas who will commit to ethics reform, transparency and the establishment of a new culture that the entire family once again can be proud of. 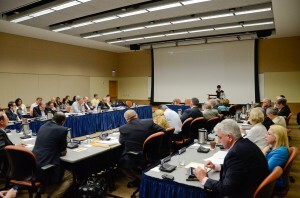 The future of Penn State must include a plan to repair the problems of the past. Blindly moving on like the good ol’ boys club wants is a recipe that ensures history will repeat itself. The decision to run again wasn’t easy. Last year’s election exposed the challenges that are faced by alumni who don’t live in the northeast, don’t have a fancy CEO title on their resume and don’t have widespread name recognition. But it’s irresponsible to complain about the lack of progress at Penn State without voluntering to pitch in. And I have a hard time standing idly by while our leaders continue to harm our alma mater. My vision for Penn State isn’t new. It involves establishing a deep commitment to transparency within a board that remains locked in a cloud of secrecy. But I haven’t been waiting for the election to take action. Since June, I’ve filed more than 12 information requests from three states in an effort to shed light on the roles our leaders played over the last year. For the last five months, I’ve been battling the Department of Education over access to Penn State’s contract with Louis Freeh. While some evidence of a conspiracy has been uncovered, Pennsylvania officials have mostly stymied my efforts. As a result, I’ve filed a lawsuit that would force the Governor and the Secretary of Education to release records of their trustee activities. Penn State continues to face tremendous challenges that are becoming easier to ignore as they fade from the front page. It’s up to us – the alumni – to elect leaders who publicly commit to transforming a culture into something we can be proud of. I’ve demonstrated my willingness to fight for the answers we deserve, and if elected, I pledge to continue those efforts and while representing your interests on the Board of Trustees.